Bath Time - Bubbles Please! About ten years ago, as a newly single mom of two young boys, I found myself exhausted and running on empty. Each night I would get my boys in their bubbles and off to bed, and then want to collapse, unable to see how I could maintain this level of effort daily. My boys enjoying our nightly routine. One night, tired and weary, I put my boys to bed and was about to clean up the bathroom, but instead - I climbed right on into that tub full of bubbles. I happened to have a candle close by on the counter, so I grabbed it, lit it, and sat there staring at the light. It was in that moment that I realized that it was OK for me to be tired. It was OK for me to have nothing left to give and to take a moment to relax, for MYSELF. What a realization! My body and soul were flooded with relief, peace and calm. That night, I slept like a baby (metaphorically speaking - yeah, we all know how babies really sleep!). So the next night and the next night and each night following, I did the same thing. I’d bring a glass of wine with me, maybe add a few drops of essential oils or a scoop of bath salts and I’d soak in the tub for 20, even 30 minutes, til the water was cool and I’d have goosebumps all over. 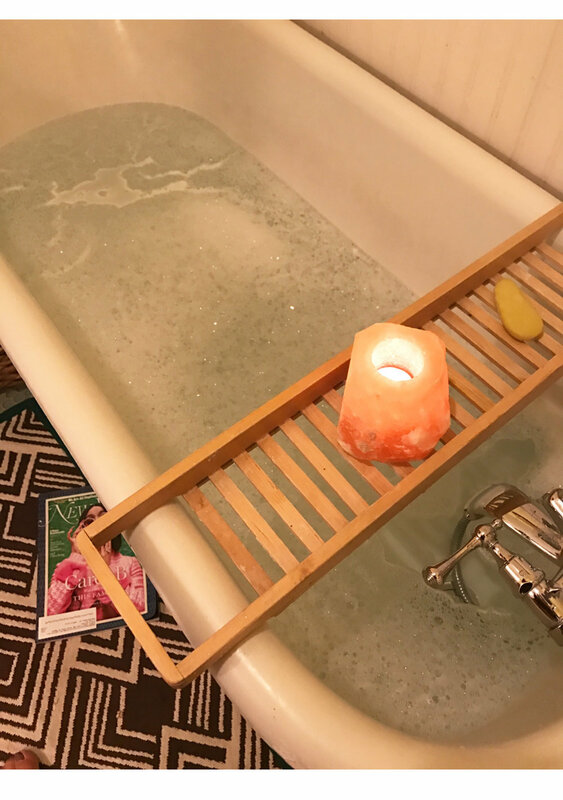 Over time, even if I only had 5 or 10 minutes, I would still stick to my newfound, lifesaving ritual - giving myself time to relax, recalibrate, and unwind. One of many nightly soaks. I found myself sleeping better, dreaming better, and feeling better. Soon I found the effects of this nighttime routine spilling over into my morning routine with my boys, bringing a little more calm and a little more peace into the start of each new day. And while this was new to my life at that time, bath rituals are nothing new - for good reason, they are a centuries old practice for many cultures. From the hot & cold baths and body scrub downs traditionally used in Turkish or Moroccan Hammam and in Korean Spas, to hotspring soaks in Iceland, Honduras, New Zealand and many other spots around the globe, going to the bathhouse often was, and is still regarded as a way of getting rid of illnesses. I recently read that in Russia, going to the bathhouse was called the "people's first doctor'"(vodka was the second, raw garlic the third). I’m so grateful that these moments of complete and utter exhaustion led me to commit to this incredible, yet simple ritual. I now have teenagers and have made nightly baths a part of my life for over a decade. Every home that I’ve lived in since, every Airbnb or hotel I’ve booked, you can be sure it had a bathtub. Saying it is ESSENTIAL to my life would be an understatement. Gather a candle or two, some bath salts and/or essential oils (I use lavender, frankincense or lemon balm). I prefer salts with magnesium, such as Naturopathica Sweet Birch Bath Flakes or Red Flower Cypress Neroli. Make sure they are clear of artificial fragrance - even simple epsom salt will do. Light your candles, turn on some light music, make yourself some hot water with lemon, fill your tub and sink into the warmth of it. Close your eyes, take a deep breath, review your day or simply say thank you for the day - whatever it may have been. Embrace it all with gratitude and grace. If you’re looking for something a little extra special, try our Hammam Body Treatment at Euphoria Studio. In an atmosphere of half-light, quiescence and devotion, this ritual of heat, steam, detoxification, rich scent and relaxation is based on the skin care practices of the hammam bath house.